"It takes courage to create. It’s an act of bravery to look deep inside and express yourself through the work of your hands. Our books nurture creative courage and empower women to communicate their stories and visions through their art." So begins the introduction to Red Lips 4 Courage Communications, the production company for "Freddy and Gwen Collaborate Again: Freewheeling Twists on Traditional Quilt Designs." And as each of us puts on our red lipstick for courage, our imaginary red eyeglasses ;) or just pulls out all of our red fabrics to play.....Freddy Moran and Gwen Marston have pulled forth their own unique abilities in the development of 70 new and innovative quilt designs. With an amazing 20 quilt designs from Gwen, and another 20 from Freddy, and then 30 more that they made together....what more could we ask for? When Eileen Cannon Paulin, President and resident 'Creative Custodian' for Red Lips 4 Courage, their books' publishing services and production company, offered me a copy of the book to give-away on my blog...I leaped at the chance. It's that much fun and so worth sharing and passing on! Filled with free wheeling patterns and carrying energies which evolve from the principles of traditional patterns, to the creative flow of color and form unique to African-American quilters like The Gee's Bend Quilters, to that amazing spontaneity of modern or interpretive art (the book includes patterns for shapes, pieces and blocks, as well as suggestions for combining your own pieces from a 'spare parts' department) and creating your own unique extensions in color, design or form. If you'd like a chance to have this book sent you...completely for free...please leave a comment below. And then link back to this post on your own blog if you have one! And if you already own this book, you can still be in the running and win it as a gift for another quilter...or anyone who sews that you might want to cheer up, encourage, or inspire! Please be sure to leave a comment and please help me spread the word by sharing this link in a post note on your own blog! And if you're a 'no reply blogger' or don't have a blog, please send me an additional email request to insure that your name is added into the drawing. This is our opportunity to show the power and influence of blogs and bloggers in the world of information and marketing potential...not only to those who read here, but to Freddy and Gwen, themselves! And if you don't have it yet, comment and let me know that you'd love a chance to own it. Everyone is entered just by commenting! Freddy and Gwen: In Sisters Again! WOW, PLEASE add my name to the hat. I just love these two quilters. Ive been checking this book out of the library, but evidently someone else wants it too because I can never renew it!! I would love to own this colorful work of art! I can still remember Bonnie sitting in my studio saying how wonderful Gwen's work is...so liberating and free as she was showing me that I didn't need a pattern and to just express myself and put pieces together freely...a yes, the crumb pattern with fabrics I dare not ever think would go together. Liberating...yes! I want it, I want it! Please, oh please, let me win! I love the celebration of creativity evoked by the Red Lips of Courage concept. It does take courage to put your ideas and creations out into the world. It's like birthing yourself in a way and presenting yourself as a gift to the world. Thank you for sharing this as well as your generous give-away offer. Please do not worry about adding my name to the drawing as I'm having to get rid of books as it is due to my allergy problems. What a great giveaway. And how sweet that they want you to do this. Thank you for this great giveaway. I'd loved to be entered in the drawing and I've shared your link on my blog. I love it when 'greats' get together to create. Please throw me into the pot. Oh how I have wanted this book! The first one was fabulous and, for someone like me who started out very traditionally, it's a way to be set free of the old notions of quilting. Sign me up. I've spent the summer in a creative log jam. Wow! Just looking at the cover of this book inspires me. I love the bright colors. I'd love to win this book! Thanks for sharing. Throw my name in the hat, will you? I think I need a jolt of whatever motivates them! Certainly this is another winning combination for authors and books! I am always looking for ways to think outside the box, and I'm sure this book with inspire me. Enter me please! wheee, I love this book, so happy to see it getting attention. Don't put me in the draw, I'll just send folks over your way. Ah, that's my kind of quilting! Would love to win this book. Wow! Please enter me in your great giveaway, I would love this! What a fabulous giveaway. Gwen and Freddy are so inspiring!!! I'd love a chance to win! I am just starting to become more adventurous in my own quilting, and would love to win this book. Please count me in for your giveaway! I so want this book, I spent hours in the library this week reading Gwen' book "Liberated Quilts", I love her work. I've had the pleasure of meeting both Freddie and Gwen while working as part of the program committee for my local quilt guild. I absolutely adore them both and I can't even begin to imagine what fun it would be to see the two of them TOGETHER!!! I so hope that I win! They sure do know how to work the thread and fabrics don't they! Add me! I was about to buy it until I saw it on your blog! Oh, please enter me--I love everything those two do! I have really enjoy their other books. I would love to add this one to my library. I don't own any Marston or Moran books so this would be a great addition to my library. Both ladies work is classic and I always come away inspired when I browse their books at teh library or a friend's house. I'd love to have it! And thank you for the wonderful posts of the Sisters show. I would love to have this book. Please put my name in the hat! What a great book - I'd love to be in your draw! Please add my name to the hat as well... Thanks! I listed your web site on my Eclectic Quilter blog site, but had no idea how to create a "link". I'd love to enter your drawing for this book - thank you! I seldom win any drawings but I'm going to keep my fingers crossed. What a great giveaway. Please enter me in the draw and I will have my red fabrics ready. What a wonderful prize! Please enter my name too. 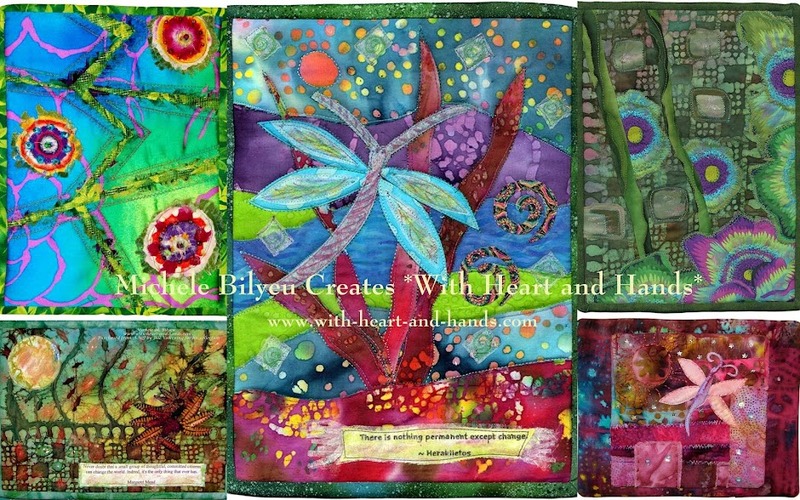 I have Collaborative Quilting and LOVE it to bits. Thank you. How coincidental that we both post giveaways on the same day! You rock, girl! I live in Colorado where Freddie happens to be speaking this weekend. I just came form hearing her and seeing all her wonderful quilts. She is quite a woman! I would love to have this book of quilting inspiration. Please enter me. Enter me, enter me! I was looking at this online and wishing I had it! Thank you so much for being involved in a give-away like this! This is so wonderful! I would LOVE to win this book! I don't have a blog but I want to be entered. I'll send you my email address to be official! I'd love to win this book! I would absolutely love to win this book. It's on my list of quilting books to read, savor, and inspire. Thanks so very much for the opportunity to win! Years ago I purchased Liberated Quiltmaking, and I was hooked. Then I got "sidetracked" with traditional hand applique, but would often reread Gwen Marston's wonderful book. Did I have the nerve to try such free style techniques? Well, finally I did, and I love every bit of it. I've gotten some of Gwen's books from ILL through my library, but would love to own this collaborative book. I can't buy it, but I can continue stretching my creativity and this book would be the best thing. I would love to win this book--it looks wonderful. Thank you! Wow! I would love to win this book. Put my name in the hat! I loved their first book and made a beautiful quilt because of it. Thanks for the chance to enter the drawing! Quilt On! This is such a wonderful opportunity. I had the chance to purchase their first book, and have been really wanting the second one. Thank you so much for doing this. Hope I win! I would LOVE to receive a copy of the book. Keep up the pretty work. Please enter me -- I'd love to win this beautiful book! I loved the first book so I'm sure this one is a winner too. I'm drooling over this book! Please enter me in your drawing. Gwen and Freddy are inspiring and their quilts are fun and cheerful. I'd love to win their book! What a great giveaway! Would you enter my name in? Thanks!! Oh goodness gracious me. I'd kill to own this book, but knowing my luck with give-a-ways I'll just have to keep oggling the cover. However, there is always hope! I know I am their biggest fan - definitely put my name in the pot and I'll keep my fingers crossed. Me, too! Love Gwen and Freddie! I'd so love to win this book. Please enter me in your great giveaway, I would love this! These look like great fun! Please enter me for a chance to win. thanks for offering us all a chance at this. #64 comment here ! You well know I have been spreading the word on Gwen and Freddy for a while now...love all my books by them and can't wait to go take a class in March with Gwen. I will put a link on my blog this weekend..helping them out is my pleasure- and how terrific you had this chance to do this as well !!! I definitely want in . . . would love to read this book! You are very generous and what a great prize. I love how you write and I love reading your blog. Have a great day. I pre-ordered this book so that it would arrive as soon as possible! I don't need to be entered in the drawing but want to share that Freddy and Gwen inspired the liberated scrappy basket quilt that is currently on my design wall. Their example has encouraged me to create in so many ways ~ and I return to their books again and again when I'm feeling empty or bland. Their words and colors always help me get back on the path! I would love to be in the draw for this book. The work of these two ladies is so fun and awe-inspiring. Please add my name to the list! I will email my details as I do not have a blog yet. I would love a chance to win this book. I have just landed a job after 8 months of unemployment, so I haven't been buying many quilt books and I am a big fan of Freddy and Gwen. What a nice cover, that looks like a very interesting and cool book! I hope I have a chance at winning it! I would love to have the book, love, love, love, love, Love it! Me, me, me....pretty please! I love this collaborative team and have their first book. I'd love this one. am I too late? My first ever quilt was a "freddie's house" quilt! I'd love a chance to win Gwen & Freddie's book. Their liberated piecing is exactly that--liberating! Count me in! I loved all your stories about Gwen and her hubby! PS I wore the turtle socks - oh so comfy! You really missed out! Freddy Moran is such a lovely person, I've had the chance to meet her in Houston when her first book with Gwen Marsten was released. She was very gracious with spending time discussing the book with me and then signing my copy. I would love to take a class with both of them one day soon. I do own both of their books but I am sure I know of another quilter or two that I would share it with if I am your lucky winner. I am a huge fan of Freddy Moran and Gwen- the colors are so rich and they have such energy and love of quilting that it comes through in both of their books. What a wonderful thing to do- my computer comes back tomorrow so I will post a link when I write my blog. Would love to be entered in too....like everyone else, I've been admiring these quilters' works for a while now and would loooove to have the chance to own a little piece of their talent!!! I would love to be entered in the drawing for this book. I have the first book they did together, its one of my favorites. Thanks for the giveaway. Thanks for having this drawing! Took a class from the two at Asilomar and it was the most rewarding ever! Thank you for this giveaway. I live in Hungary and I'd loved to be entered in the drawing. Thanks for offering this book. I'd love to win! I don't enter giveaways often--only the ones that I'd really like to win. I posted a entry on my blog about the giveaway too. Oh I would love this book! I love their first colloboration!!!! I would so love to own this book! I don't have a blog, but I'll send you an email address just in case! 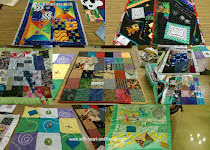 I've watched Gwen and Freddy's classes, quilts and books on other sites and I just think they are both amazing! A Freddy & Gwen collaboration (twice!) If not for bloggers, I would have missed out big time. One day I might even have one too. I have the first book and would just love to own the 2nd one. Thank you for having a giveaway. Hello there, I'd like to have the chance to win the book "Freddy and Gwen Collaborate Again: Freewheeling Twists on Traditional Quilt Designs. ", please count me in, I already blogged about your giveaway, thank you for the oportunity! Do please enter me! I love both these ladies' work and spirit of creativity. Thanks for the giveaway. Well, if this drawing is still open, then count me in! I love the ideas in this book! Thanks for the opportunity to perhaps own it! Congratulations to Laurel and my thanks for commenting to all of the rest of you! Great fun!! It was extremely interesting for me to read that blog. Thanks for it. I like such themes and everything connected to this matter. I definitely want to read a bit more soon. Oh, it's beauty.. i like it. 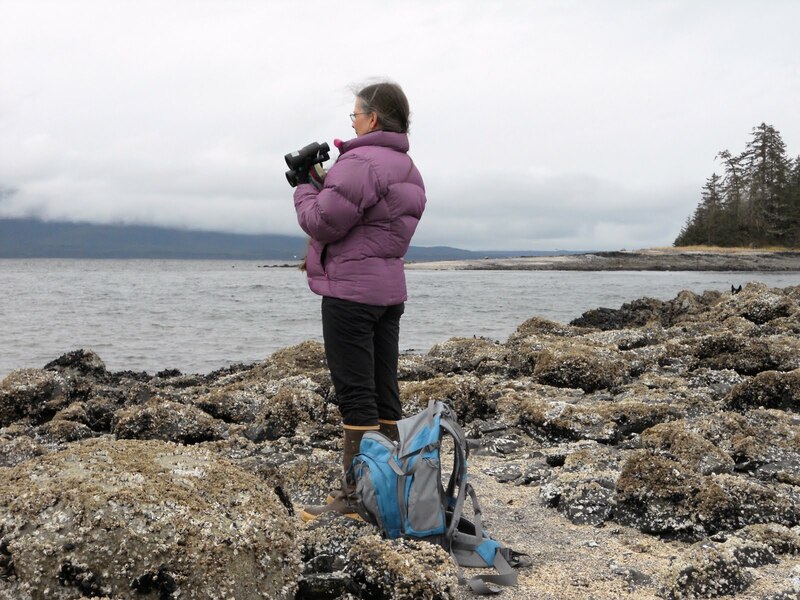 Sharing my blogging and creative arts and quilting journey from Douglas, Alaska to Salem, Oregon. My life and my art...created with my hands, and from my heart. Tracking the Journeys....Since October 26, 2006~ Over 9,000,000 blog views! Thank You for 9 Million Visits! Quilter's ADD: Most Stash, She Won! Disappearing 4,9,16 And Other Patch and Twist/Turn Variations! Happy Easter - The bunnies hopped in to help me wish you a Happy Easter! New journals in my Etsy Shop! - I listed three new handmade journals in my Etsy shop. Please click *here *or the badge on the right side of this blog. Thanks for checking out my blog! Ho’oponopono for Earth Day - How this ancient Hawaiian tradition can bring harmony this Earth Day. The post Ho’oponopono for Earth Day appeared first on UPLIFT. It must be Spring. - Windows open, Sun shining, Birds singing, Buds bursting. It must be Spring - today at any rate! Follow Michele's board Michele Bilyeu: www.with-heart-and-hands.com and http://freequiltpatterns.blogspot.com on Pinterest.